LEAH WHITE and Steven Berke first clapped eyes on each other at a Habonim Dror camp in France when they were 13. And they met up again three years ago when they were both in London. The pair were married at Bramham Park, Yorkshire, by Beth Hamidrash Hagadol Synagogue's Rabbi Jason Kleiman. Leah, the daughter of Sandra and Andy White, of Roundhay, Leeds, and Steven, the son of Anne and Tony Berke, of Prestwich, Manchester, run an internet business together. Best man was David Epstein. Bridesmaids were Deanna Gilman, Sophie Woodward, Ruby Posner and Olivia Rosenberg. After a honeymoon in America and Mexico, the couple have settled in Leeds. MULTI-talented Lauren Fingret celebrated her batmitzvah at Beth Hamidrash Hagadol Synagogue on Shabbat. 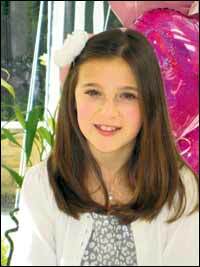 The daughter of Shelley and James Fingret, of Shadwell, Lauren is a pupil at the Grammar School at Leeds. Lauren excels at acting, singing, dancing and swimming. Grandparents Shirley and Stanley Fingret, of Leeds, and Carole and Clive Clifford, of Southampton attended the simcha. Also present was Shelley's sister Melanie Mendelsohn and brother Jacob.